You can say that the flavors that they make are more focused on old school or classic flavors such as old fashioned glazed and fruit flavored cream filled doughnuts. Non the less, their doughnuts are still awesome especially when it comes to (my personal favorites) their Apple Bacon Fritter and their Mango Square doughnut. 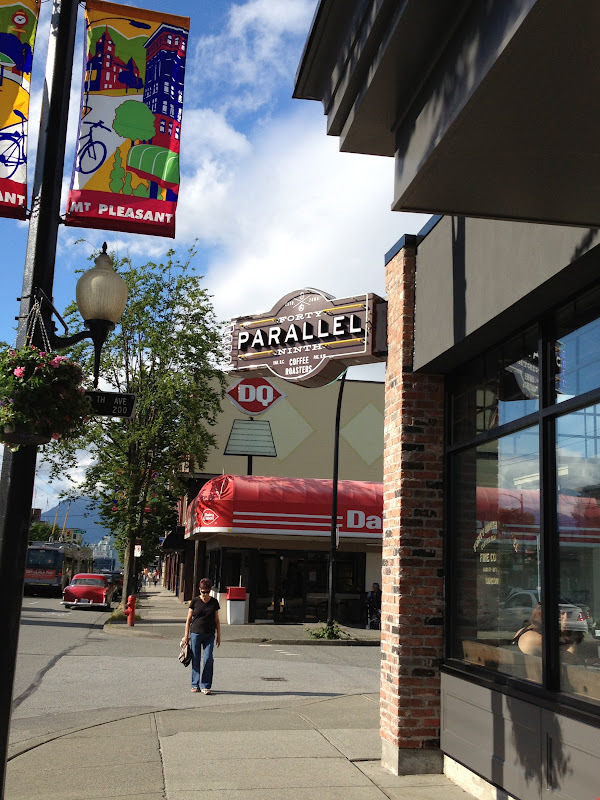 This place is also a bit hard to spot because when we were looking for the place, the address led us to 49th Parallel instead. We didn't know that Lucky's Doughnuts is actually located inside the coffee shop so we kept wandering around the area looking for their sign, but it's a good thing though that we went back to 49th Parallel and took a peek inside, because we probably would have just left without knowing that we were already at the right place all along! With a counter set up at the front of the store and a wide variety of baked goods to choose from, we ended up deciding on their Apple Bacon Fritter, Mango Square doughnut, Old Fashioned Glazed doughnut and their Coffee Cake doughnut to try. All four of them looked and smelled really good but what stood out the most to me and my taste buds were the Apple Bacon Fritter and the Mango Square Doughnut. I was literally mind blown by the taste of their Apple Bacon Fritter! 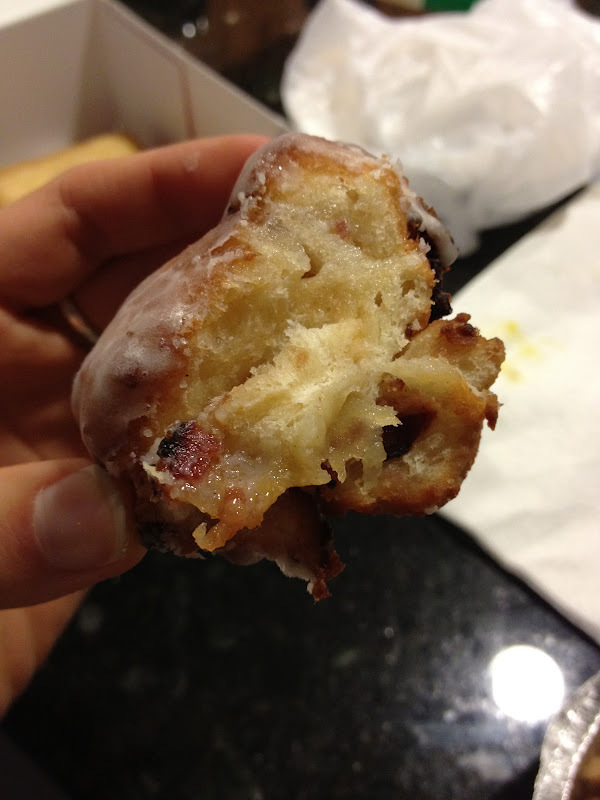 It had the right amount of apples and bacon bits that made the doughnut all the more irresistible to eat! It's the perfect mixture of sweet and savory in a doughnut and I just wanted to have more! Normally I don't eat this much sweets/fried food on a daily basis but I actually finished two of their doughnuts (Apple Bacon and Mango Square) in one sitting! Like the Apple Bacon Fritter, the Mango Square surprised me as well. When I ordered the Mango Square, I initially thought that the doughnut batter was just mango flavored but lo and behold, it also had mango filling inside it! I super love cream filled doughnuts so when I found out that the Mango Square is a bavarian-ish type of doughnut, I ended up finishing it in just a few minutes! This doughnut also reminded me of my favorite pie (Peach Mango pie) that I would always get in Jollibee. If you guys don't know what Jollibee is, it's a fast food chain that's very popular in the Philippines and having been born and raised there, Jollibee was like our favorite fast food joint to hang out/eat at after school besides Mcdonalds. Besides the Apple Bacon and Mango Square, the other two doughnuts were not bad as well but I found that their coffee cake doughnut and Old Fashioned Glazed wasn't anything special compared to the first two. Also, the Old Fashioned Glaze was a bit too sweet and heavy for my liking so I ended up only eating a small piece of it. But I guess it also depends on what kind of doughnut you like right? I mean people have different tastes so I can't really judge it for you unless you also give it a try yourself. Comparing their doughnuts to Cartems' however, I would have to say that Lucky's doughnuts have a denser quality to their doughnuts and have sweeter glazes. Price wise, Lucky's is a couple of cents more expensive than Cartems and as I recall, they charge about $3.25 - $3.95 for a piece of doughnut depending on which flavor you get. Lucky's do make good quality doughnuts but if I have to pay more than $3 for a doughnut before taxes, I would rather just buy more of Cartems' doughnuts (it's way cheaper and they have more unique flavors to choose from). Overall however, I would have to say that Lucky's doughnuts is more of a hit or miss kind of place. They do make good quality doughnuts but the variety and taste of the flavors that they offer may just be so so for some. 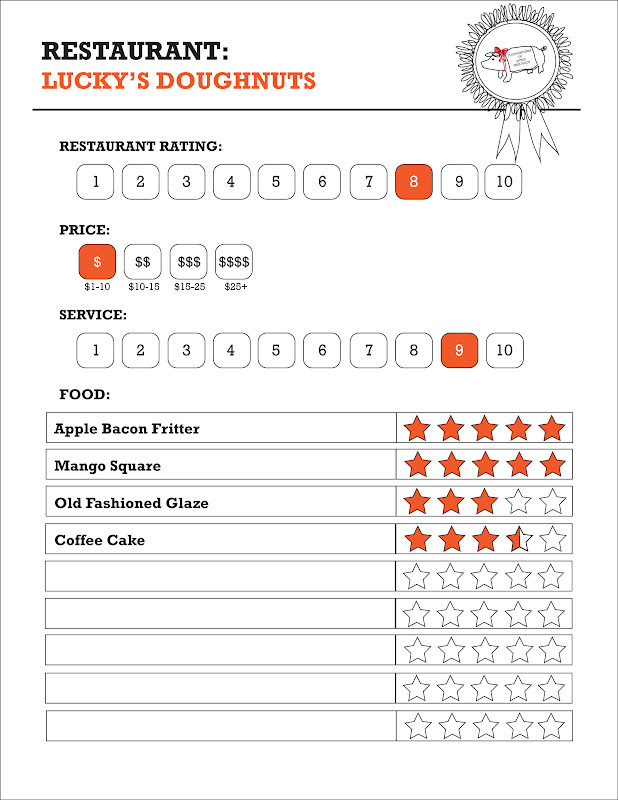 Personally for me, I still like Cartems' doughnuts better but because of their Apple Bacon Fritter and Mango Square doughnut, I am officially a fan of this place as well. 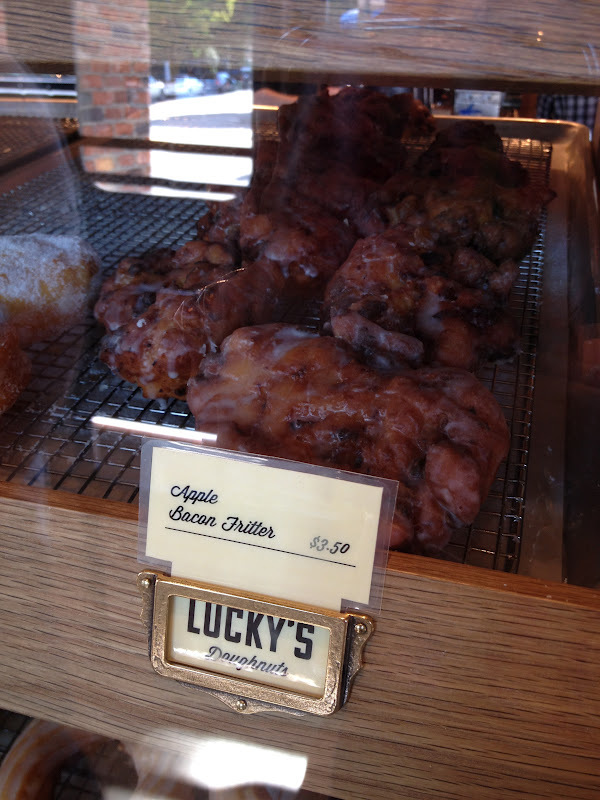 thanks for the great info on Lucky's Doughnuts and Cartems' the pictures are awesome. I'll have to make a trip to both doughnut shops soon.